I can see that this is going to be a very helpful book for many people – it is well organised and contains readings which are both inspirational and clear in showing values of goddess spirituality. There are also meditations, which fit well with the readings and would do much to further those values in our lives and in society. In addition, there is a useful section of resources in the appendices, including films, groups and writers to check out. Even the words and music to a couple of suggested goddess songs or hymns, although the suggested tunes are such well-known Christian hymns that I suspect simply changing the words wouldn’t be enough for me to feel comfortable with them; that’s a personal view, of course. The book works on many levels - political, spiritual, inspirational, and will undoubtedly be a valuable resource for people seeking to create and structure goddess ceremonies. However, I do have some reservations. To me, the readings suggest sermons, and I'm not comfortable with that. I have a mental image of people sitting in a church, and whatever you call it, a church is a church, carrying with it, for me, all the negative connotations from a childhood spent being made to feel bad about being a human, and an “inferior” female one at that. I’ve spent many years healing myself from the resulting self-hatred and setting foot in any church isn’t part of my treatment plan. There's something ironic here: in the UK, we have a state religion and this is blithely ignored by some 85% of the population (most people really only bother with church for funerals and the occasional wedding). I have never visited the US, but understand that the First Amendment to the Constitution forbids any established religion – yet around 40% of the population claim to attend church weekly. I have no idea what percentage of these churches are accepting of goddess, but it does seem that this book may be of greater value there than here, where the majority would never be in a position to benefit from it. I have an even bigger problem with the first sentence in Part 1 of the book, which is: "Goddess is a Democrat!" Perhaps I can be forgiven for not seeing a huge amount of difference between US political parties, which strike me as either far right of centre or somewhat less so. What is this party allegiance supposed to mean to me, to other Europeans and to the rest of the world? I understand the argument that follows in this section of the book, but cannot bring myself to believe that any change in underlying mythology will reform political systems quickly enough to overthrow the ills that the author lists in time to do any good. Because of the use of the capitalised version of the word “democrat”, I’m forced to assume that this is a party political statement. Even if this were not the intention, I’m not very reassured: what does the word actually mean? It comes from the Greek, of course, and approximates to “rule of the people” – but which people? The accepted view of “the people” changes over time: in Classical Athens only men of a certain class were included. At the date of my mother’s birth women were grudgingly allowed a vote in Britain, but only if they were both over the age of 30, and met property-owning conditions. There isn’t space here to allow a full discussion of the various groups excluded from the franchise in the USA over the years, but these have included Native Americans, Jews, Quakers, Catholics, African Americans (and the latter, in my own lifetime, were actively discouraged from exercising their rights when they did have any). Not to mention, of course, women. And what of the homeless and the imprisoned? Maybe the book isn’t intended for European readers, who find it annoying when some Americans assume their political views are shared by the rest of the world, and terrifying when they appear to be about to impose their particular brand of democracy on us. 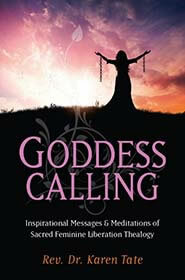 Goddess Calling is published by Changemakers Books, ISBN 978-1782794424 and is available on Amazon.